23.12.02. Production Information on A Midsummer Night's Dream. The touring history of this production is complex and lengthy and information on it will be added later! 1.12.02. Tidying up the 'Lulu' information and the Sally Beauman page. Added a news archive page for old news. 15.11.02. Much Ado About Nothing production information and review added. 12.11.02. Addition to Leslie page. Picture of Leslie and Irene Howard from Film Weekly 5.5.1933, in an article called A Private View of Leslie Howard, by Irene Howard. 10.11.02. Production Information on Coriolanus. 10.11.02. Production Information on Henry IV Part One and Part Two. 6.11.02. Alan is currently filming the BBC 1 adaptation of P.D. James' Death in Holy Orders, playing Father Seabastian Morell. See Introduction/News for more details. 5.11.02. Check Introduction for news of an October outing to Newcastle - with the RSC. 20.10.02. Production information added for the Henry VI trilogy. 13.10.02. Another bit of trivia! from Sheridan Morley's theatre column in Punch, collected in his book, Shooting Stars, plays and players 1975-83. 12.10.02. Re-design of Trivia page! Thanks to Brigitte for the photograph! 5.10.02 / Time, 19.12.01 / Review of The Lord of the Rings. 22.9.02 / Patrick Stewart interview. 16.9.02 / Sally Jacobs interview. 10.9.02 / Extract from Peter Brook and Shakespeare, (Richard Proudfoot. Printed in Themes In Drama 2: Drama and Mimesis (C.U.P. 1980). ) Antony and Cleopatra. The interviews with Patrick Stewart and Sally Jacobs will be up soon! 5.9.02. / Birmingham Post, 29.10.80 /History about to complete itself / article on the Richards at Stratford. 30.8.02. /Richard III, Antony and Cleopatra, Much Ado About Nothing, The Henry VI Trilogy, The Merchant of Venice and Twelfth Night added to Playing Shakespeare. 29.8.02. Henry IV Part I , Henry IV Part II and Measure for Measure added to Playing Shakespeare. 28.8.02. / Article added - Howard's ends and means / Plays and Players, July 1975. This also links from the Playing Shakespeare/Henry V page. 26.8.02. / Richard II added to Playing Shakespeare section. 26.8.02. / It had to appear some time! Churchill's People! A famous moment in TV history. 13.8.02. 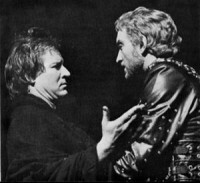 / King Lear added to Playing Shakespeare section. 13.8.02. / Troilus and Cressida added to Playing Shakespeare section. As You Like It and Macbeth added to Playing Shakespeare section. Troilus and Cressida and King Lear will be next. Alan's views on Coriolanus - in discussion with David Daniell, from 'Coriolanus in Europe', Athlone Press, 1980. 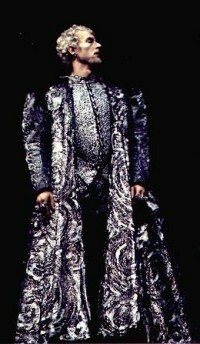 8.8.02 / Playing Shakespeare 'Coriolanus' added. 6.6.02: / News items on the site will now be announced at the bottom of the Introduction page and dated. This page becomes New on the site, announcing the additions of articles etc. A new Playing Shakespeare page will list the plays and have navigation to the various articles, reviews etc which hopefully will make it easier to use for the Shakespeare students! Independent on Sunday, 30.3.1997 / How We Met / Alan Howard and Christopher Logue. Article on Sally B and Destiny from Company Magazine, April 1987. Best of the Bodice Rippers. Rebecca's Tale has been shortlisted for the WH Smith Thumping Good Read Award. In depth article from The Dublin Review, Number 7, Summer 2002, McGuinness and the Boys, by Adrian Frazier. Sections 3 about the history of Edward's and Mac Liammóir, and 6 about the Orson Welles' Othello have been cut - though they are interesting - and the focus is on the play itself. Extract from Rosenberg's The Masks of Hamlet, published 1992.
Review for Good at The Booth Theatre, New York, USA. The Guardian, 13.7.02: Spell it out - Sally Beauman on writing. (I put one of my favourite Fuseli paintings in as an illustration. I use it when teaching Shakespeare in art and drama, and the 'vasty deep' joke is one of my favourite 'Shakespearean bits' as well!) Oh, and for those like me who don't know what an RSJ is - I had to ask my partner - it's a load bearing steel girder used in building. A few corrections to Career List! Television review of Coriolanus, BBC2, Daily Telegraph, 23.4.84. Dianeira review added to radio section. Review of War Music, Radio 3 / 10/5/81. Had a chat with Frank McGuinness in the bar after the performance of 'Gates of Gold' last Saturday. He says they want to tour it, at least to London, but he wants the same cast. So fingers crossed! Theatre was full and stunning performances from Alan and Donna Dent - there is a great deal in this play and I would like to see it again. 'Rebecca's Tale' is still riding high in the paperback book charts. It is the Penguin Readers Club book of the month. Click here to go to their website and read their interview with Sally Beauman. Two new pictures of the production. Many thanks to Sinéad McGrath of the Gate Theatre who has been absolutely wonderful in sending information and pictures! Reviews of 'Gates of Gold' from INDUBLIN and from the Irish Evening Herald. The Irish Herald review is placed under the Times' review as they are written by the same critic, though, unlike the Sheridan Morleys of this world, it is a different piece obviously written for a different reading audience - same sentiment, different style! It makes for an interesting comparison. Some other comments on Alan's performance - not the Triffid one (see Trivia) - are underneath the INDUBLIN piece. Sally is 'doing' the Edinburgh Book Festival on 13th August at 12.30pm. Out to lunch with Alan Howard - article in the Sunday Express Magazine, 1.5.1994. A 'Macbeth' review indicating the critical divide over this production - splitting the critics! Interview with Alan about 'Gates of Gold', Irish Examiner, 5.5.02. Next article! Independent July 1995. Cover added to the television section. Saturday 18.5.01: Rebecca's Tale is at number 5 in the Times paperback fiction chart. Saturday 11.5.02: Rebecca's Tale is at number 9 in the paperback charts. Gates of Gold review: The Stage, 9.5.02. Gates of Gold review: Financial Times, 8.5.02. Gates of Gold review: Daily Telegraph, 7.5.02. Edited some of the Reviews linked pages and added programme pictures. Some exclusive production photographs from Gates of Gold! Thanks to Sinéad at The Gate Theatre! Production Photograph of Gates of Gold! Last bits on radio Forsytes! Play it again Soames, from the Sunday Telegraph 7 Days magazine, 23.9.1990, and a review. First reports in from Dublin! Play is very good, Alan is wonderful - sit on right side if possible as he is stage left all the time! - Cheers at the end on first preview night - and a fantastic dressing gown for curtain call. The women are also very good. Dublin cold, wet and windy and everyone except the cast has a cold. (A slight exaggeration, I think). More added to The Forsyte Chronicles - family tree, cast list and interview - follow the links from the Radio page. A review of The Country Wife at the Belgrade Theatre, 19.6.59. I'm not sure if it was edited as it reads rather strangely occasionally! Reviews of 'Roots' at the Belgrade Theatre, 25.2.1959. All really great actors tend to split critical opinion in certain roles. Here is a new page linking to Trivia showing some of the varying viewpoints on certain performances! Early interview at the Connaught Theatre, Worthing - interesting historically. Tidied up the Trivia page and added some more 'gems'! Some slight improvements to the Sally page - prompted by the Bath Literature Festival linking to the page! Sally is appearing at the Festival on March 9th, 4 pm at the Guildhall. Improvements to the Howard family page, with an extra picture added. Review and photograph of Abraham Lincoln at the Belgrade Theatre, Birmingham Mail, 4.11.59. Some historical information on the Belgrade Theatre! Link to and from the Belgrade and Coventry Review page. Great Expectations photograph confirmed by Charlie Kay! It definitely is G.E. not Christmas Carol. Film Reviews page begun with a review of The Cook, The Thief, His Wife And Her Lover. Rebecca's Tale in paperback - update on Sally B news! Interview with Alan about London - and 'Flight' - in 1998. National archive attributes it to 'This Is London', they say no and suggested 'London This Week'. Anyway, it is not one that many of us will have seen! It has ben added to the Articles for Research page. Picture for Five Finger Exercise. Review to follow! Sound! Not top quality, but enough to get a reasonable idea! Review of A Christmas Carol. Birmingham Post, 9.12.58. New production pictures! One More River - IN COLOUR!!!! Thanks to MH for this one. Great Expectations - although this is listed in the Coventry Archive as A Christmas Carol! Charles Kay was not in a scene with Wilkins (Alan Howard) in Carol, but he was in scenes with Pip in Great Expectations, so I have reallocated it! Colour picture of Never Had It So Good. Colour picture of Charley's Aunt. Two pictures of I'm Talking About Jerusalem and Pygmalion 1960 in colour! Interview in the Coventry Evening Standard, Thursday 24th December 1959. One for the connoisseur! Alan is the Voice of the Ring in the film of Lord of the Rings! More pictures added to the family pages. Edward Compton in 'To-morrow' and Isabel Bateman with Irving in 'Othello'. More about 'Hamlet'. A report on the rehearsals of the 1970 'Hamlet' production at Stratford. Observer, 1970. Article on the World Tour of 'A Midsummer Night's Dream' taken from 'Flourish' the RSC magazine, 22.5.73. List of reviews and articles 1960s to 2000. (These may take approximately one minute to load.) There is a link from the list of Articles on Alan for' those doing serious research' page. Living with Rebecca. Sally Beauman on her new book. Guardian, 12.9.01. Sally B will be on 'Woman's Hour', Tuesday 18th September, discussing Rebecca's Tale. Alan was spotted in the audience at the Almeida on Monday night (for Platanov), and chatting with Ian McDiarmid in the interval. He was with his partner, Sally Beauman. Extracts of Rebecca's Tale published in the Sunday Express magazine, 2.9.01 and 9.9.01. Sunday Telegraph 2.9.01. Article on Daphne du Maurier and 'Rebecca' by Sally B. New 'Lulu' picture from The Independent, 5.9.01. Reluctant Heroes review, the Belgrade Theatre, Coventry, 12.5.59. Midsomer Murders new series begins Sunday 26th August. Dark Autumn will be screened on Sunday 16th September! Rumour, totally unsubstantiated and possibly not true, but here it is anyway! Brad Pitt, Olivia Williams, signed up for 'The Gambler', based on the Dostoyevsky novel. Alan Rickman and Alan Howard are to play his mentors. Hmmmmm! Production photograph for The Chances, Chichester, 1962. More comments on the 'Bridge of Sighs' bubble car! Addition to 'In his own words' page on his beginnings with link to the review that backed up his family's opinion! Sally page additions and slight redesign. Advertisement in the Irish press for Gates of Gold. Insights into the Forsytes: Gillian Reynolds previews BBC radio's epic dramatisation, Daily Telegraph, 29.9.90. Forsyte Chronicles begun and review for The Dog It Was That Died - links up and running! Introducing two new sections - radio and television, but the links will not be activated until there is a decent amount of information on the pages! The first will be on The Forsyte Chronicles - the BBC Radio 4 version, of course! Replaced picture in article on The Royal Pretender! so it is now different from the one in A full house! Article, On with the motley, Observer, 26.5.1985. News on Rebecca's Tale, the paperback from Waterstone's Quarterly Magazine, Issue 4, 2002. Article: Once more into battle (with Mr Howard in his tent). From the Glasgow Herald, 22.8.91. The new page on the Gate website now puts the last night of 'Gates of Gold' as June 8th! Worth checking out if you want a half term holiday in Dublin to coincide with a theatre visit! More news about Gates of Gold. The Changeling review - Encore Magazine, May/June 1961. Newcastle Journal article - A Full House - 19.1.1978. All RSC reviews now have at least one image of a programme for each production. A page on The Tempest has been added, although not as a review. It has a link to the Trivia page for the comment on the 'goddesses'! New article from June 2000 - Howard's Way - from What's On In London. Additional picture is from one of the Bath newspapers. Improved the Articles section a bit - well, a lot actually! Click on the articles links to judge the 'improvements'. The Sally Beauman pages on Rebecca's Tale have also had some maintenance work! Doing plays the Howard way: article in the Highbury and Islington Express, 4th September 1998. 'The Private Ear' and 'The Public Eye' review, Worthing Gazette, 30.10.1963. Reviews added: From the Belgrade Theatre: Not in the Book, Ferdinand the Matador, The Merchant of Venice and Uncle Dundo. From The Orange Tree Theatre, Winter. Five Finger Exercise review added to production photograph. Monday 11th and Tuesday 12th March, BBC1, Alan is in 'Manhunt'! Hot off the press! The Gate Theatre, Dublin, announce the world premiere of Gates of Gold by Frank McGuinness. Cast includes, Donna Dent, Alan Howard and Richard Johnson. Previews from April 25th, opens April 30th. Box Office: 0035318744045.